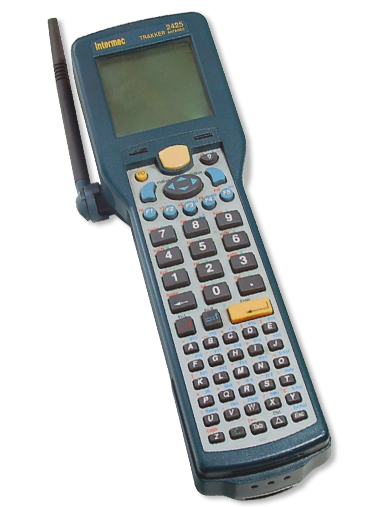 The Intermec T2425 is the wireless model of the TRAKKER Antares hand-held line. It will operate in rough industrial conditions and low temperatures even after repeated drops. It quickly and easily interfaces to existing applications with factory-installed terminal emulation options for ANSI/VT 100/220/320 and IBM 3270/5250 terminals. Contact us today about buying, servicing, renting or selling T2425 gear! A powerful 2.4 GHz radio provides excellent area coverage and high interference immunity with a data rate of 1.6 MBPS for maximum throughput. Powered by a rechargeable lithium ion battery pack, the T2425 also boasts an integrated laser scanner that reads all major bar codes. The large display provides enough space for menus, help screens, or even graphics. It is tilted to improve readability while scanning, and the alphanumeric keyboard provides tactile feedback with the frequently used numeric keys oversized for easier input.Contact us today about buying, servicing, renting or selling T2425 gear!